The frontal rails of a vehicle structure are the primary energy absorbing components during a frontal crash/impact. The axial mode of crushing is desired to ensure efficient energy absorption. MSC SimXpert was used as part of an independent study/research project for crash simulation. The project was focused on conducting quasi-static axial crushing of thin walled automotive sections and comparing the results of First Order Analysis with the Finite Element Analysis techniques. The major assumption associated with the first order analysis model was the use of a non-compact section (b/t > 62.5 mm) and 1.5<b<3.75 in. (Note: Here b and t are the width and thickness of the cross-section).The initial finite element model for the thin-walled section was made in CATIA. The beam was modelled using two-dimensional triangular beam elements. We assumed that the material is loaded in the elastic region only. CATIA predicted the critical buckling stress obtained by FEA to be within 7% of the theoretical buckling stress as given by the first order analysis model for varying values of b & t. Despite these results, we found that CATIA is not particularly suitable for simulating and design visualization purposes. 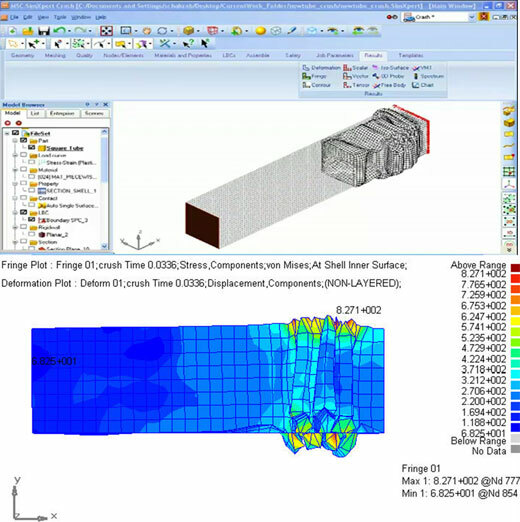 The challenge of the project was to accurately simulate and visualize the crashworthiness of the section for the given material and boundary conditions. MSC SimXpert's Crash Workspace was used to simulate the axial mode of failure of a thin-walled steel tube with square cross section. The impact on the cross-section was assumed to be a rigid wall moving with an initial velocity. The basic FEA model was created in SimXpert and completed with materials, boundary conditions, loads and analysis and output options before performing the crash simulation. Assigning material and physical properties to the model. Defining simulation / output file parameters. Running the simulation and analyzing the results. The complete pre- and post-processing based on LS DYNA was carried out in a single integrated environment for the crash and impact analysis. We found the MSC SimXpert to be a very useful tool in the completion of this project and highly recommend the use of SimXpert especially for simulation and design visualization purposes. The image below shows the crash simulation and the corresponding fringe plot for Von Mises Stresses at time t = 0.0336 seconds after the impact.